A 1-hr “Introduction to Scattering” lecture Collins presented at the 2018 ALS User Meeting, primarily to UC Berkeley and Standford graduate students. 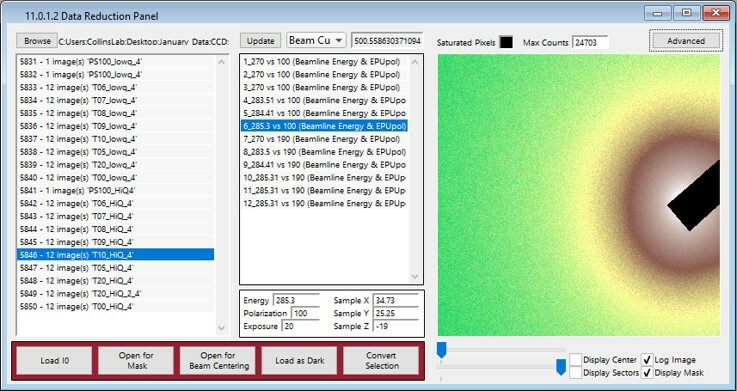 The ‘11.0.1.2 Data Reduction Panel’ is a skin on the general SAXS/WAXS data processing tool ‘NIKA’ written by Jan Ilavsky that facilitates convenient data browsing and streamlines the work flow of data processing for Resonant Soft X-ray scattering (RSoXS) conducted at beamline 11.0.1.2 at the Advanced Light Source. The panel alters all settings appropriate for RSoXS processing and removes the need to interact with NIKA’s complex main panel. The goal is rapid, error-free data processing during data acquisition at the beamline that enables accurate qualitative assessment of scattering features and data quality. This panel – originally developed by Elliot Gann (NSLS II) – has been adapted to Igor 7 and the latest NIKA release by Thomas Ferron (WSU) and further improves the workflow of RSoXS data processing. It was written such that it will continue to be compatible with future releases of NIKA. Data acquisition, processing, analysis, and plotting environment. Help with NIKA can be found at the APS USAXS website. Download Panel Installer – Zip file containing required Igor procedure files and installation instructions. You will need to unzip the folder to install. Please contact the Collins group at WSU if you find bugs or would like to propose new features.